India continues to shine brightly on the seventh day of the 21st Commonwealth Games in Gold Coast Australia, with Shreyasi Singh clinching a gold medal in women’s double-trap, Om Prakash Mitharval bagging a bronze medal in the 50m pistol finals, and M C Mary Kom and Gaurav Solanki assuring India medals in their respective boxing categories. Meanwhile, ace shooter Heena Sidhu on Tuesday clinched a gold in the women’s 25m pistol event, taking India’s gold count to 11. Heena maintained her prowess throughout the game while other shooters — Chain Singh and Gagan Narang — disappointed by finishing at fourth and seventh, respectively. Para-lifter Sachin Chaudhary won a bronze for India in men’s heavyweight category. With 21 medals, India finished at the third position in the medal tally. Indian boxers showed phenomenal performance by assuring five more medals for the country after securing their places in the semi-finals. India qualified for semi-finals in both the men’s and women’s hockey events. In badminton mixed doubles, Dipika Pallikal and Saurav Ghosal defeated Guyana and Pakistan to advance to the Round of 6. Day 7 started with a glorious performance by Indian shooters. Jitu Rai and Om Prakash Mitharval entered the final round of men’s 50m air pistol event. However, Jitu Rai was later eliminated from the men’s 50m air pistol event. Earlier, Rai had bagged a gold in men’s 10m air pistol event, while Om Mitharval had clinched a bronze in the same event. Here are all the latest updates around India’s performance and medals tally at the Commonwealth Games 2018 being held in Gold Coast, Australia. 1. 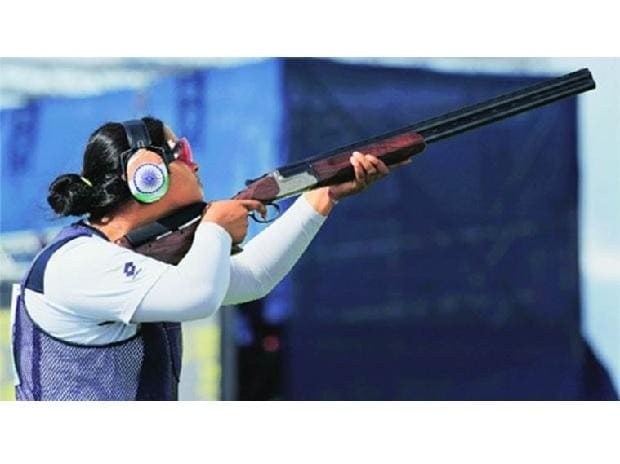 Shreyasi Singh wins gold in women’s double-trap shooting: Shreyasi Singh brought India its 12th gold at the 21st Commonwealth Games in the women’s double-trap event. She defeated Australia’s Emma Cox in the final round, with a total shot of 96 in the final. Vikas Krishan Yadav entered the semi-finals of men’s 75kg boxing category. Vikas also registered a comfortable 5:0 victory over Benny Muziyo of Zambia in the last eight stage. Vikas assures a medal from the 21st Commonwealth Games 2018. 3. Mary Kom enters final: Indian boxer MC Mary Kom defeated Anusha Dilruksh to enter the final of women’s 48 kg at the 21st Commonwealth Games. Her dominance was such, she carved out a unanimous 5:0 verdict against the veteran Sri Lankan fighter. 4. Gaurav Solanki assures silver: India’s Gaurav Solanki convincingly beat his Papua New Guinea opponent Keama 5-0 in men’s 52kg boxing category to enter the semifinal round. Solanki assured India at least a silver medal in the category — the seventh assured boxing medal for India. 5. Om Prakash Mitharval bags bronze in 50m pistol event: Indian shooter Om Prakash clinched bronze medal 50m pistol event. This second medal of the Commonwealth Games 2018. However, the gold medallist of 25m air pistol event, Jitu Rai disappointed. Jitu Rai was the first one to be eliminated in 50m pistol men’s final. Om topped the standings at the end of the qualification stage with a score of 549 points. Jitu qualified at the sixth position with 542. 6. Five boxers assure five more medals for India: India at present is at the third position in the medal tally but all thanks to the Indian boxers, India’s medal tally is going to increase. Five Indian boxers reached semi-finals and assured five more medals for India in 21st Commonwealth Games. Manoj Kumar qualified for the semi-finals in the men’s 69kg category, all set to bring his second Commonwealth medals. Amit Panghal, Mohammed Hussamuddin, Naman Tanwar and Satish Kumar joined Manoj Kumar by securing their places in the semi-finals of 49kg, 56kg, 91kg and +91 kg respectively. “This is definitely going to be the biggest medal of my career so far. There is no doubt about that,” said Amit Panghal after defeating Aqeel Ahmed of Scotland in a split 4-1 verdict. Both Manoj and Hussamuddin will be up against English opponents in their semifinals bouts. While Manoj will face Pat McCormack, Hussamuddin will be up against Peter McGrail.